The company behind Dungeons & Dragons and Magic: The Gathering is adding another card game to its tabletop roster, only it’s slightly less weird than fantastical loot-happy heroes or elemental-plane-hopping monsters summoners. It’s about those giant robots in disguise that you know and love. Yesterday Hasbro and Wizards of the Coast officially revealed the appropriately titled Transformers Trading Card Game, a two-player competitive card duelling game where players build up decks of Autobots and Decepticons to do battle with each other, transform, and roll out. Well, actually, they flip out. One of the Transformers TCG’s gimmicks will be large-sized character cards depicting the Transformers themselves, which will be enhanced and equipped with your main “battle” deck. But on top of that, there’s a “transform” mechanic where the character cards are double sided, allowing you to flip a card over to change it between its vehicle and robot forms. Sure, you’re not performing elaborate acts of trading card origami, but it’s something to recreate that changeover idea from the series. But beyond embracing the wild world of Transformers, the most intriguing thing about the new game is the chance to see what mechanics and gameplay Wizards of the Coast can come up with for a card game outside of its regular work on Magic: The Gathering. There’s more than just the fun nostalgia of a big card with Optimus Prime on it—there’s a chance for a very intriguing new card game to evolve out of it, too, one that offers an interesting alternative to the company’s work on Magic. 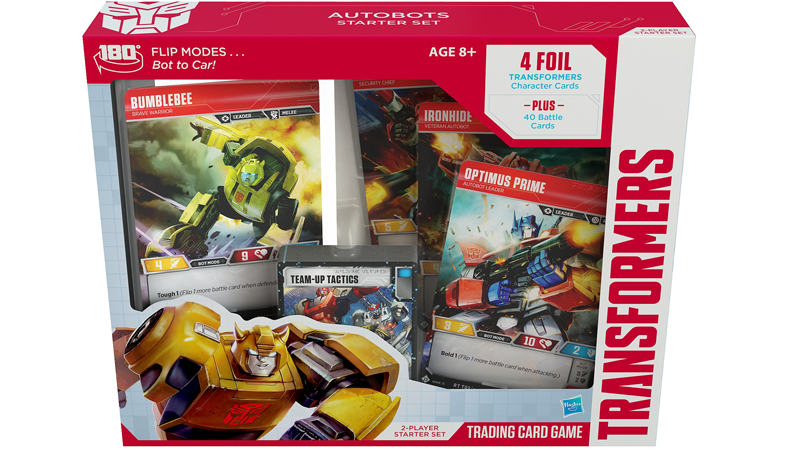 The Transformers trading game is set to launch with a basic Autobot-themed starter set and the first wave of booster packs in the US September 2018; UK availability and pricing has not yet been announced. Fans who want an early look at the game will be able to buy a special “convention-exclusive” four-pack of cards at San Diego Comic-Con (and from Hasbro’s official online store) next month.